I received many of these fun goodies from Oriental Trading in exchange for this post. Affiliate links included in the post. This is the perfect spring/summer setting for a formal event, a tea party or a wedding! I love pastels. My wedding was 17 years ago next week and I love pastels just as much now as I did then. 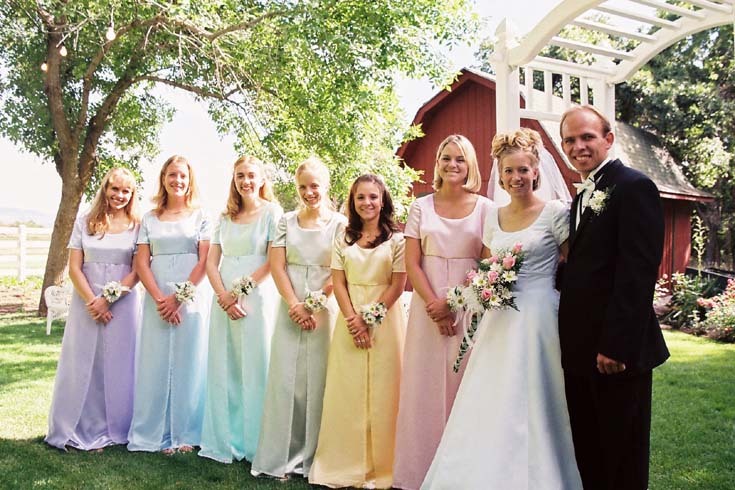 All my bridesmaids wore different colored dresses in pastel rainbow colors. Our venue was my best friends family's gorgeous yard and the weather was perfection. Anyways, it was the perfect fairy tale wedding. I've recreated the look with pastels, fairy lights, white accents and paper flowers. Oriental Trading has a new tab for everything wedding, check it out here: Marry Me! I used simple strips of paper and some brush markers to write the place settings. Check out this tutorial for easy brush lettering. There's a full tutorial for the paper flowers on this post. Paper flowers make a huge statement. They are very economical to make (just paper and hot glue) and they are big--so they make big impact! You could do a whole photo backdrop wall...or just here and there for accents. Like, save, pin, follow, comment and share! Come back tomorrow for more fun wedding themes!